Armcoil is now offering the market a sophisticated minisub which incorporates a bund wall and storage tank to retain oil should the oil-filled transformer leak. This new design addresses the environmental risk and clean-up costs associated with oil spills from minisub transformers. low voltage energy from a medium voltage network. Every oil-filled transformer must be installed in such a way as to contain oil should it leak from the transformer. Transformer oil – especially mineral oil – is harmful to the environment and increases the risk of fire. Oil spills are largely due to slow oil leaks, attacks from metal thieves or vandals, or result from human error at the time of maintenance or installation. Bund walls allow for the containment of spilt oil. Fig. 1: Flash chute and lifting lugs visible on the roof of the minisub. Protecting the environment against an oil spill, and air pollution produced by an oil fire, is not only the responsibility of the people doing the installation or the routine maintenance, but it is also the responsibility of the design engineer to mitigate all possibilities of oil spills and fires contaminating the environment in the event of a failing transformer due to human actions. Armcoil, a rapidly growing electrical equipment company based in Roodepoort, west of Johannesburg, manufactures and repairs transformers, motors and other electrical equipment. 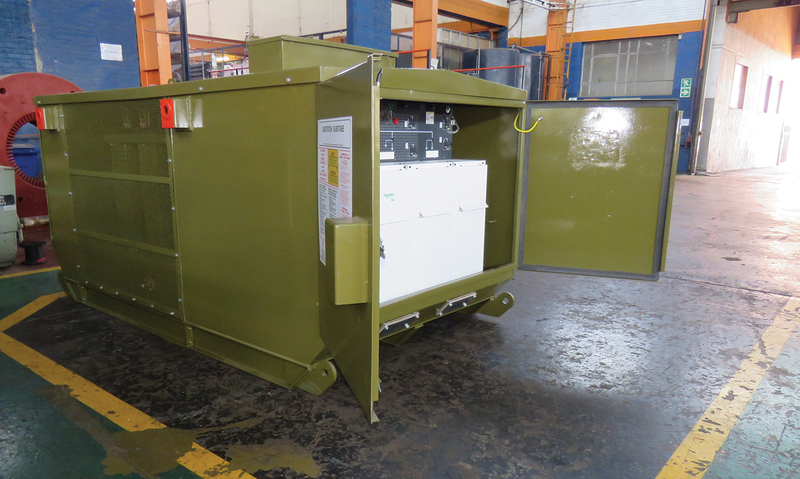 The company recently developed an innovative minisub enclosure design which incorporates a bund wall and storage area for transformer oil should the transformer leak. This important feature helps the company’s minisubs to comply with environmental regulations, and also removes the need for oil clean-up mitigation equipment and procedures to be put in place when the minisub is installed. The enclosures are designed to be robust and built to protect all the equipment they house and can also be ordered with built-in fire suppression units. These locally designed and manufactured minisubs offer tamper-resistant features including a sophisticated door-locking mechanism which makes forcing the doors open virtually impossible. Fig. 2: Minisub with doors open, showing the RMU. 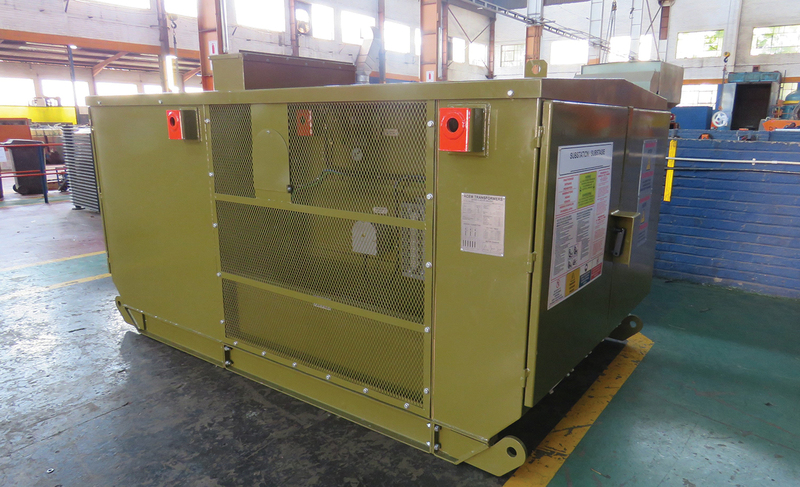 These minisubs are available in a wide range of capacities ranging from 200 to 3150 kVA; with primary voltages ranging from 6,6 to 33 kV, and secondary voltages from 415 to 3300 V.
Special features include a “flash chute” on the roof of the unit which will blow off in the event of an explosion inside the minisub guaranteeing operator safety; as well as pre-fitted lifting lugs and built-in skids which can be fitted with wheels should the client wish to be able to move the minisub without having to order a mobile crane or rigging team. The units are designed to be used anywhere – including corrosive environments. The cabinets are made from either mild steel or 3C12 – a form of stainless steel – and treated with a special “coastal” coating which protects them from corrosive sea air. Their modular design makes the repair or upgrade of internal equipment easier and therefore less expensive.